“Today we’re going to visit the syphilis museum” is a breakfast-time announcement that will wake up the most drowsy of your guests, I promise you. Several of mine have wondered if there was something in the Sicilian air that was affecting their hearing and I have had to assure them that I was serious: Yes, Modica has a syphilis museum, or, to be more accurate, a museum devoted to the treatment of the disease in the eighteenth century. The Museo Tommaso Campailla is not easy to find, is not signposted and is mentioned in few guidebooks. It is tucked away in two rooms in what was once the Ospedale Santa Maria della Pietà and is now a municipal office building behind the Piazza Matteotti, the main square in Modica Bassa. To visit, you have to make an appointment via the Modica Tourist Office, for it is their staff who have the keys and act as guides for the visit. Tommaso Campailla [1668 - 1740] was first found fame as a poet and philosopher. 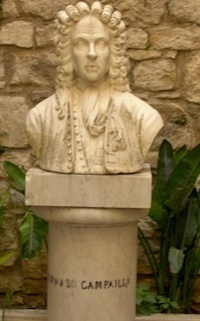 He was admired by the Irish philosopher George Berkeley who came to Modica to meet him. It was not until the death of his father that Campailla was able to indulge his passion for medicine, for at that time, the profession was not considered respectable for a man of his class. No one knows why or how Campailla became interested in the treatment of venereal diseases, but treat them he did, creating wooden botti [barrels] for the patients to sit in and inhale mercury infusions. This treatment seems to have been pioneered in France, where the patient's head would project from the top of the "barrel". Campailla's design was squarer, and the patient sat with his or her whole body in the "cabin". The wood was of a special kind which Campailla ordered from abroad and to this day, no one knows exactly what it was. First the "cabin" was heated to 70 F by a brazier and then, the brazier removed, the patient would enter, carrying a small oil lamp for light, which he or she would hang on a nail, and a smaller brazier which was placed on the ground beneath his or her feet. There were two holes in the door of the cabin and the patient was monitored through the top one. 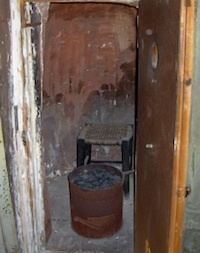 Through the second, at the bottom of the door, the mercury infusion was poured onto the small brazier. The dose for a first treatment was half a gram of cinnabar and a pinch of incense [the incense being added to facilitate breathing]. This was doubled at the next treatment. 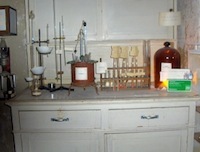 Eventually, the patient would sweat the infusion off, back onto the small brazier. The sessions lasted for ten minutes, on alternate days, and normally a patient would have nine or ten treatments. In more serious cases, two grams of cinnabar would be used and the patient would receive up to thirteen treatments. After a "cabin" session the patient would lie on a bed to continue the "sweating it out" process, which was long and extremely uncomfortable. By all accounts the treatments worked provided the disease was caught early enough and some patients with rheumatic conditions were also treated. The building continued to be used as a hospital for many years and Campailla's methods were used until the discovery of penicillin. Modicans are a little reserved about their unusual museum and many of my friends here know of it but have never been inside. I can understand that syphilis was not a disease much talked about half a century ago but today sexually transmitted diseases are hardly a taboo subject. Many of Campailla’s patients were, of course, prostitutes and when I told my Albanian friend, Rosa, about the museum she said that he should have “left them to rot”. Personally, I am glad that someone took pity on these women and helped them. Once again, I am proud of the little town that I have made my home.